RARE VINTAGE 1985 SNOOPY CREDIT CARD WALLET RED. Shipped with USPS First Class Package. EASY TO CLEAN PLASTIC/VINYL WALLET FROM UNIVERSAL STUDIOS JAPAN. Nice lot of 3 Snoopy toys. Great addition to any collection! This is a very cute snoopy Coin Purse. Bag is appx. Pictures above are from the front and the back of the bag, plus inside the bag. This is a rare discontinued item, we only have a few left. We do combine s/h fees. Handmade cotton fabric Snoopy at the movies inspired cotton fabric coin purse/card holder (gift cards, credit cards, debit card). There is a zipper closure with snoopy inspired zipper pull and side key holder. 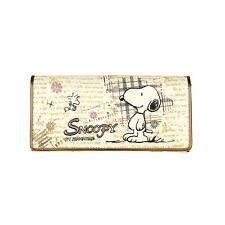 Coach Peanuts Snoopy Small Wallet. Color: Chalk. Pebble leather. The clear cover is made of a high-quality 12-gauge vinyl with two 8-gauge clear die-cut pockets inside. Checkbook pocket is top-loading for top-tearing (standard & duplicate) checkbooks. The one clear die-cut pocket is a divider for duplicate checks. Very cute cover for a snoopy fan. BACK OF WALLET IS VELVETY TYPE OF MATERIAL. Cute little glass seed bead coin purse. Coach x Peanuts 16108B Boxed Snoopy Mini Skinny ID Case Wallet Black NWT. Attached split key ring. Credit card slot and ID window. Item: 16121B. Coach x Peanuts Snoopy Small Wallet. Snoopy box included. Pebble leather. Outside zip coin pocket. STYLE - 53633. Coach "Horse & Carriage" embossed trademark. Soft Calf Leather in a Neon Yellow Green color (would say Chartreuse Yellow). Has wallet matching leather zipper pull. Wallet is accented with black zipper cloth.